After the Brexit vote, I wrote that there could be an impact on EU registrants based in the UK. Over the past year, the UK government has been engaged in negotiations with the EU to navigate the application of Article 50 and the UK's exit from the European Union. While there has been a lot of focus on issues like the customs union and the border between Ireland and Northern Ireland, the eventual departure of the UK from the EU will have a tangible impact on the European digital economy. 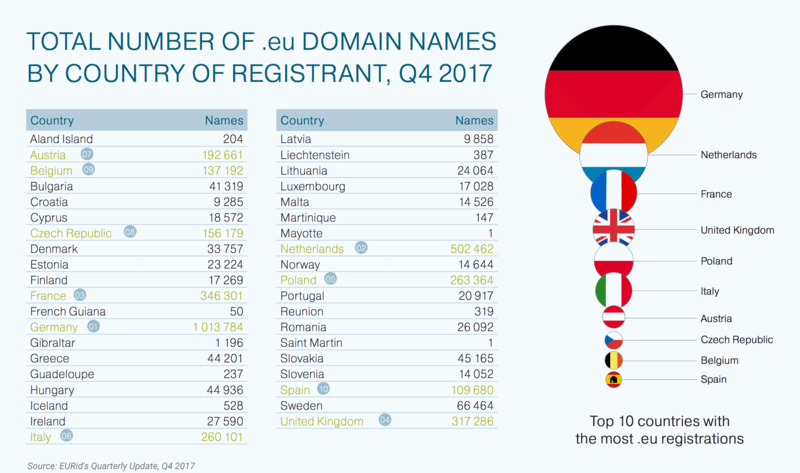 While the UK leaving the EU could be seen as having a clear impact on future registrations of .eu domain names, one would have expected the European Commission not to want to disrupt existing domain names and their registrants. When other domain spaces have updated their policies, they've usually offered some form of "grandfathering" for existing registrations to minimise the negative impact. However, it appears that the European Commission isn't going to take that approach. In an announcement earlier this week they've made it very clear that they have no intention of allowing existing registrants to keep their EU domain names if they are in the UK. The document does give a very slight glimmer of hope, but it's only a tiny one. It is hypothetically possible for the UK and EU to reach some form of agreement that would allow for the continued use of .eu domains by UK registrants, but it's looking highly unlikely. Here's the full text of the notice they issued. Disclosure: my company is a .eu accredited registrar and I previously served two terms on the .EU Registrar Advisory Board. This is nothing revolutionary new, it merely clarifies the existing and long-running eligibility policies of .EU where only European citizens and certain affiliated groups were eligible to register (and thereby hold) a domain name in the TLD. Once you cease to be eligible for the domain, you lose your right to the registration. While this is a harsh statement and hopefully cooler heads will prevail and allow an amendment of the eligibility criteria until the day of the Brexit, it accurately describes the current state of affairs and in effect provides sufficient advance warnings to all affected .EU registrants to review their options. Local Time: Tuesday, April 23, 2019 07:44 AM PDT – Page Load: 0.4020 Sec.